On Saturday morning we fortified ourselves with big (an understatement) breakfasts at the Old Fashioned Pancake House on W. Jefferson Street in Joliet. Theirs may have been the largest menu I've ever seen. 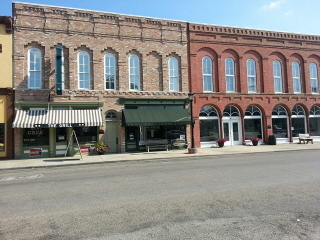 Then we returned to the Joliet Area Museum to pick up picturess and do some more visiting. 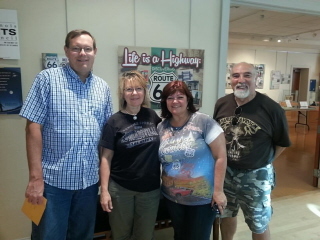 We met two couples from France touring Route 66 for yet another time and had a great visit and photo op. In this photo from left to right is Joe Sonderman, me, Sylvie Toullec, and her husband Freddy Vanhees. On our way back south, we made several stops along the old road to look, admire, take pictures, and just steep ourselves in the history. Dwight is an especially charming town, with a wonderful old railroad station (an Amtrak stop), now the home of the Dwight Historical Society, the stately buildings of the former Keeley Institute, and a Frank Lloyd Wright-designed bank. 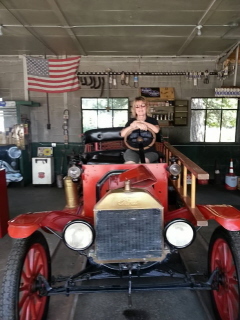 At the edge of town is the Ambler-Becker Texaco Station, a must-see where it was fun to take pictures on the old fire engine. Atlanta was our last stop and our goodbye to a great research weekend. Not only on my 66 trips but on my trips back and forth to see cousins and attend family reunions in Wisconsin, Atlanta has become a must-stop virtually every time. Atlanta only has a population of less than 2,000, but there is so much charm, Route 66 history, and great photo ops packed into a couple blocks. Good work, Atlanta.